Dualisation of old Lagos-Asaba Road from Emuhu junction to Agbor-Obi inspected by the Commissioners for Information and Works, Mr. Patrick Ukah, and Chief James Augoye, respectively. The Delta State Government has intervened in the reconstruction and rehabilitation of eight Federal roads of 149.01 kilometres and 25.11 kilometres of drain in different parts of the state. 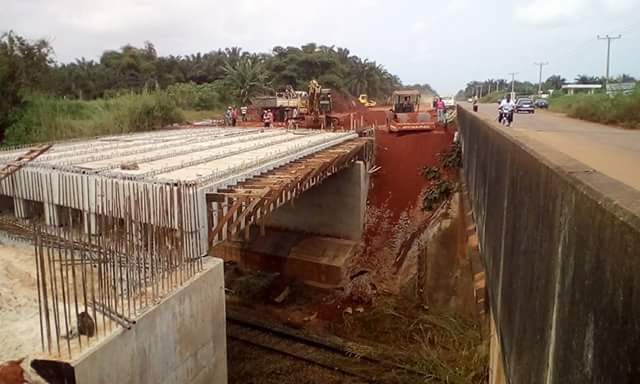 Speaking to Journalists during the recent inspection of ongoing road projects in the state, the Commissioner for Information, Mr. Patrick Ukah, said that the decision of the government was to safe guard the life and property of Deltans. Mr. Ukah, who was accompanied by his Works counterpart, Chief James Augoye, emphasized that works on the roads are not in any way affecting the progress of work on the state roads currently going on in various parts of the state. He listed the federal roads to include rehabilitation of Adeola Road/New Ogorode Road Junction (0.30 km) in Sapele, rehabilitation of failed sections of Agbor/Abavo/Umutu/Eku Road from College of Education junction, Agbor, to Eku junction (74.80 km), rehabilitation of Warri -Sapele Expressway at Ch 6 + 500 and at Ch 1 +100 from Effurun Roundabout (0.41 km) and widening of Warri/Sapele Road, Phase 1, from Effurun Roundabout to Enerhen Junction (5.20 km). According to Mr. Ukah, others are Dualization of Sapele Road from Amukpe Roundabout by Sapele/Warri Expressway to AT and P Roundabout, Sapele, (7.50 km), Dualization of old Lagos-Asaba road from Emuhu junction to Agbor-Obi junction, (9.40 km), Dualization of Ughelli-Asaba Road (Section A), (48.00 km) and the reconstruction of Ubeji Access Road from NPA Road interchange to Trans-Warri junction, Ubeji, (3.40 km).